It was quite difficult to determine a stuntman for Patrick Macnee, I analyzed a few frames through long time in the footage where someone fights with Jeremy Young in the middle plan. On some points stuntman reminded one for Patrick from The Girl from Auntie. Finally, I compared several shots from different angles until come to the conclusion that this is... Rocky Taylor. Ha, so long study for the predictable result as a whole. OK, while Rocky played as Steed again, we touch to Alf Joint. There are uncertain opinions for whom he played in the episode, although personally I have always seen the man in the picture below as Alf. One, who is Pierre's (Art Thomas) colleague. While I was working with the episode, I decided to read the dialogue sheets for "A Touch of Brimstone" from Optimum DVD. I found there the following information - one, who is Pierre's colleague, refers in these sheets as the Big man. This was answer and other confirmation: man on picture above is Alf Joint, he is credited as mentioned character in episode. In that case, who is Bill Reed? I think he only played a tall man with a bag on his head, and not more than. 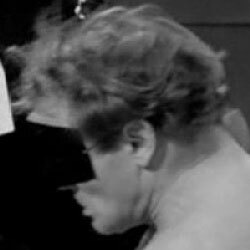 Unfortunately I do not have any Avengers Blu Ray editions, I could not see the face of a man without a mask, with which fought Robert Cawdron. 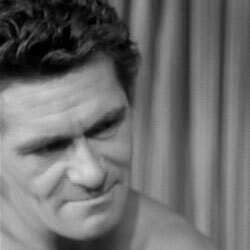 He was more like to Les Crawford for me (but I very doubt for it actually), I seen his face as very blurred. Brimstone is a hard one indeed, especially as Bill Reed looks very similar to Alf Joint. Partly they are similar, and even more thanks to method Alf used in this episode, so you're right, Piers. Actually, I do not quite understand why Alf Joint tried to hide his face in the episode? There's a strange scene in the basement, where he with Pierre engaged fireworks and Emma Peel watches for within easy reach. Alf immediately and unnaturally turns away his face from the camera and tries to do everything possible so that it could not be determined even in the middle ground. It feels like if he was as stunt double for some actor. Curious puzzle. Well, he did not like it in "Legacy of Death", movie Goldfinger, etc. OK, based on it appears other the question: why Bill Reed in this case played role where hiding the face? I think, points with Alf and Bill somehow interrelated. It seems there is an important thing at the production stage of this episode that we do not know. Let me consider my hypothesis, which will confirm your views, Piers, too. 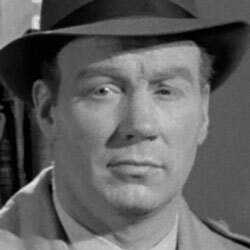 You have suggested that Bill Reed could play two roles in the episode. My hypothesis is goes in this direction too. That is, you are right to think Piers (on my opinion) that if in the scene, Bill Reid was with a bag on head, it is quite logical for the potentional reason that he could be somewhere in the episode yet (so it was necessary to hide his double presence). The same thing can be with Alf Joint. If for example, he played a masked man too (and this may be he, actually), in this case, it is clear why he was playing the Big man in this way. Well, in the process of shooting it often is not clear what the versions of footages will be in the final print and I am sure that there had to be the footage with man in a mask in the middle ground (as an option). As it was not clear what plans will in the end, they could ask for Alf hide him face in both roles. During the last week I have been studying the newspaper Times of Malta, and suddenly came across an article about William F. Sully, who played the Model in the episode The Bird who Knew too Much. It turns out that in addition to his acting work, he was also a stuntman. Surprise. Newspaper mentions his some works, including Alfie, Casino Royale and Pulp (as a stuntman). It's interesting, maybe he was doing some stunt work in series The Avengers too. Finished the work for episode What the Butler Saw. 1. Stunt Double for Ewan Hooper is... Peter Diamond (in one frame, face of Peter is completely good visible, that helped to do the conclusion). and Peter played the role Bernie in episode Honey for the Prince. 2. Stunt Double for Denis Quilley is Jack Cooper. 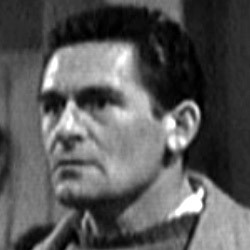 Jack Cooper as Brown in episode Trojan Horse. 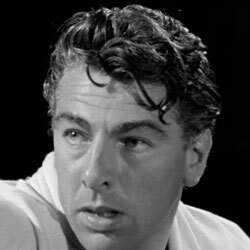 Also, I think, Jack Cooper played the one of gymnasts in episode The Master Minds. 3. Stunt Double for John Le Mesurier looks like Joe Dunne. 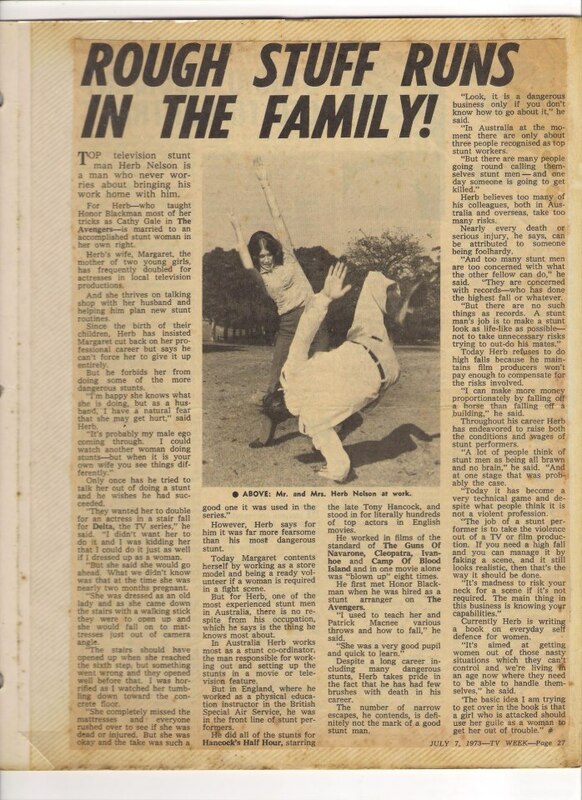 And it is more difficult to identify who played the young stunt fighter for Patrick Macnee - as hypotese, Rocky Taylor (according to the his hair at the time and some manner). Cheers, Mike Stevens again in row, at this time as one of stunt drivers for Patrick Macnee. Despite that this is the first Avengers episode where I noticed Mike in this "role", very likely that he could to performe this function before, episodes where stunt drivers are hardly visible. I noticed last night that Terry Plummer is Brian Blessed's stand-in for his fight with Tara in "The Morning After"
Great eye, Piers. Info in Mike's book confirms it. 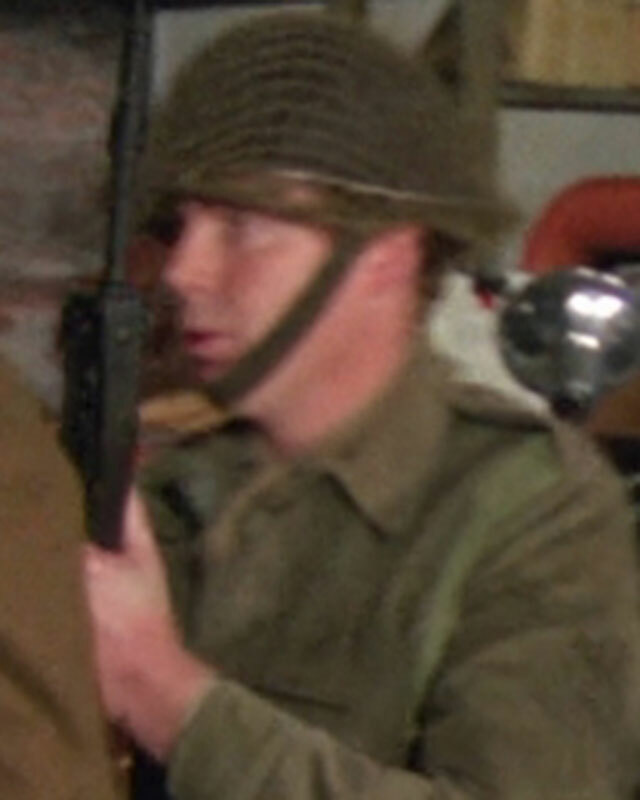 Interestingly, I nioticed that stuntman Terry Richards plays one of private in this episode. Seems this is most small Avengers role for Terry: extra. 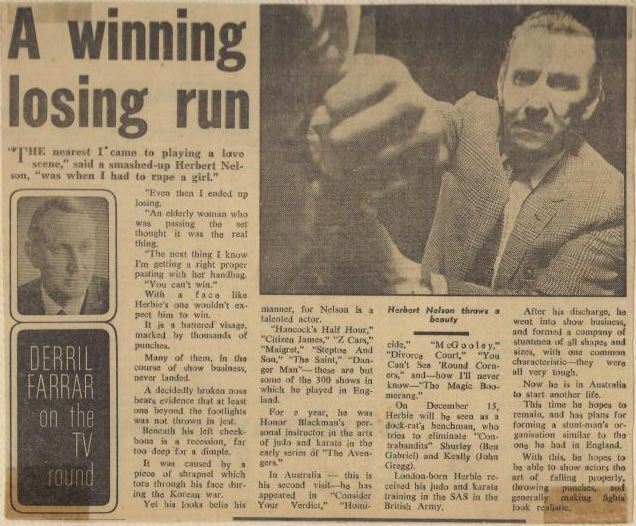 Articles about Herbert Nelson, who was judo instructor for Patrick Macnee and Honor Blackman, uncredited stunt co-ordinator and stunt arranger of Avengers in video era for an year, and actor, at the least, in three Avengers episodes. Articles are taken from Facebook page of one of Herbert's daughters. Stuntmen in the episode The Bird who Knew too Much. 1. Stunt Double for Anthony Valentine in some footages of fighting Steed and Cunliffe is... Joe Dunne (clearly visible on the screen). 2. 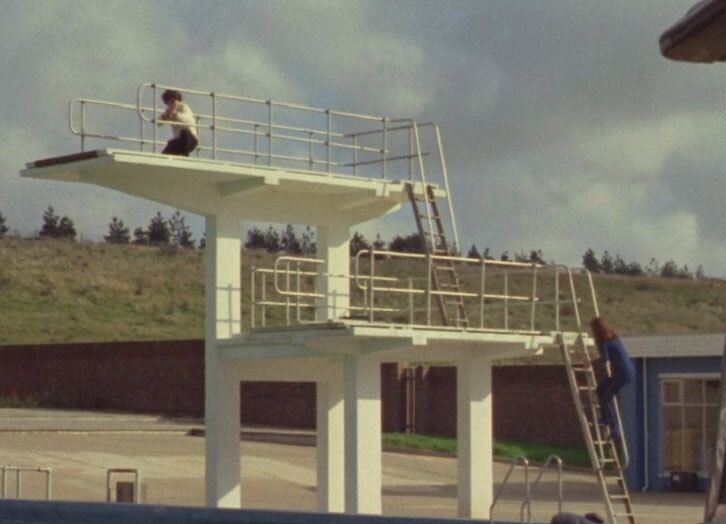 Stunt Double for Diana Rigg in footage "Emma takes a run on the pool tower for diving" is Cyd Child (not visible on the screen on prints of worse quality than DVD Optimum). In general it is clear that she did more work in this episode than just mentioned footage, which is also confirmed by her words in the interview from Dave Rogers's fanzine. 3. 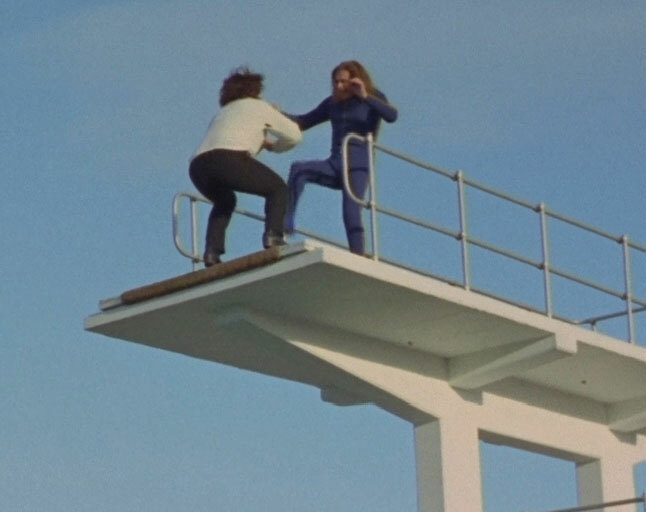 Stunt Double for Diana Rigg in footage "Emma jumps into the water with the pool tower" is a man (fortunately, face of Peter J. Elliott is not visible on the screen even on DVD Optimum). 1. 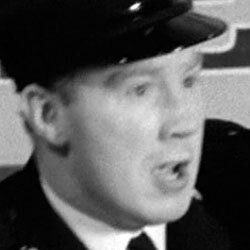 When Cunliffe fights with Steed, there are two footages in which Patrick is replaced with a doubler (the understudy is seen only from the back and most likely it should be Rocky Taylor). 2. Stunt Double for Michael Coles in footage "Emma throws Verret from carriage" looks like Gerry Crampton in one frame I catched (nevertheless, I'm not sure how it can be seen only the smaller part of the stunt person's face in that frame). 3. Stunt Double for Clive Colin-Bowler in some footages looks like Paul Weston (I'm not sure how these footages with stuntman are shot in the distant plan). Cyd is in the car when they pull up in the street, and does the crouching behind the purple Morris and leaping over the pool fence. All the long shots of the diving board are Peter J Elliott. Thanks, Piers. I agree that there might be a Cyd in the car, but this is filmed from such a far point, I thought that it was impossible to see even on the Blu Ray. As always, I understand that Cyd could personally tell you about it or you read a rare interview with her. (Cyd) does the crouching behind the purple Morris and leaping over the pool fence. Agree. Although we do not see her face in these scenes, but the behavior is typical of Cyd. 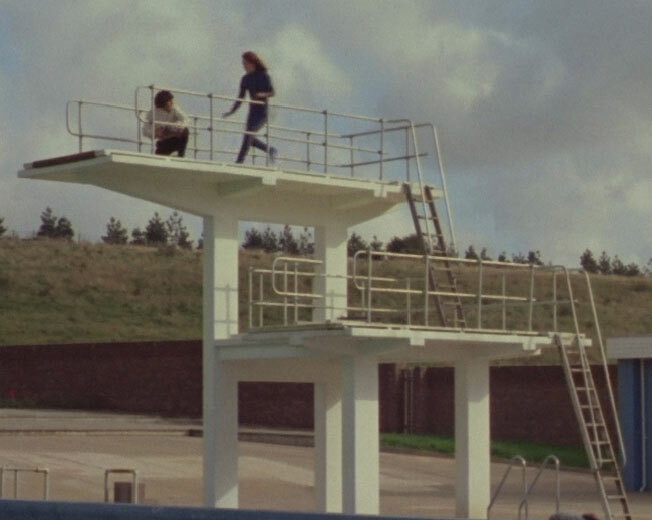 All the long shots of the diving board are Peter J Elliott. Despite the things in the interview, situation that we see on the screen says there was used another version in the final editing of the episode, I think. That is, funny, but exactly Dave Rogers is right, when saying in article following: By run-up, did she mean that she ran along the diving-board, then stop at the edge to allow the editor to cut in Peter Elliott doing the dive? Yes, this is what we see on the screen actually. 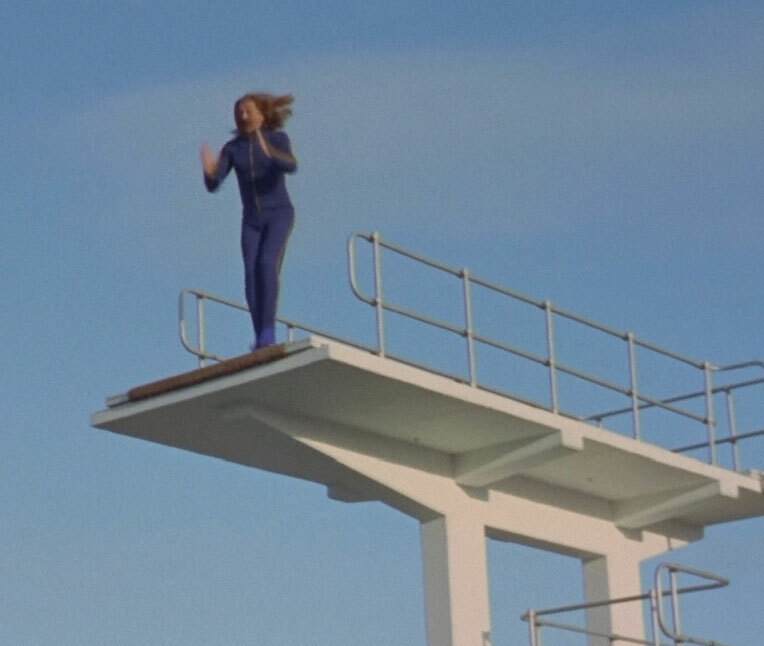 Cyd Child takes a run on the diving board for diving (below is shot from DVD Optimum). Though this screenpshot is not clear enough to draw accurate conclusions, but if you watch at the whole footage on DVD Optimum and better on Blu Ray, it becomes clear to Cyd. Peter J. Elliott are in following footages, I think: "Emma strikes Robin and he falls into the water", "Emma jumps into the water with the diving board" and "Emma with Robin in water". Hmm, right now I rewatched again, and actually probably that Peter was stunt double for Diana Rigg in some footages of fight scene "Emma vs Robin" too. Thanks, Piers, again. Very poorly visible on the DVD Optimum. Hmm, I disagree. I really hope you don't think Cyd looks like that. I suspect her whole take on the board was unused because when we see Emma in the water she's dragging Robin - perhaps that is Cyd. Please, Piers, could you post here exactly this screenshot below from the Blu Ray. I sure, you will see Cyd Child. and thanks to it now are more clearly - on first one is Cyd, others (except one above) are Peter. Yes, fair enough. 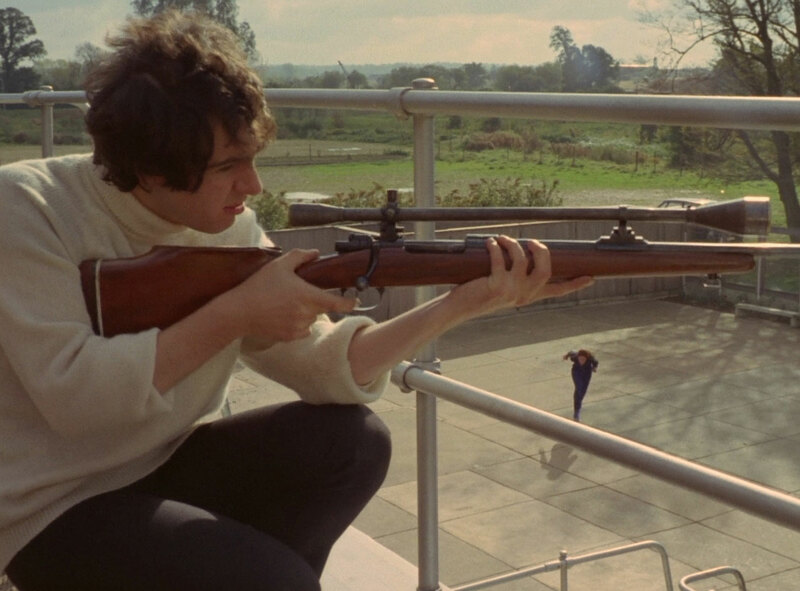 Cyd appears from the bit where she creeps past Robin's car and climbs the fence, runs for the ladder and climbs up until she kicks the rifle away. Peter takes over for the fight, then Cyd return to do the steps back then run to dive, after which the scene is edited so Peter does the dive. Great, Piers, Cyd's face is seen more clearly on Blu Ray than I thought. I will save them in a folder on my computer. Thanks! It is possible that we would have always thought that it was Peter on the run on the board, if Cyd did not look at the camera (looks like if this was one of first takes). And this point leads to good question, wonder why it was decided to include exactly this a take with Cyd at the final editing of TV episode (well, there is doubt that it was the only take with Cyd or in all the takes Cyd was looking at the camera for a specific reason). I don't think she's looking at the camera, she's glancing to see where the railing is as she reaches for it. Ah, now I understand! Today I began to seriously think about to buy Blu Ray drive for a computer. 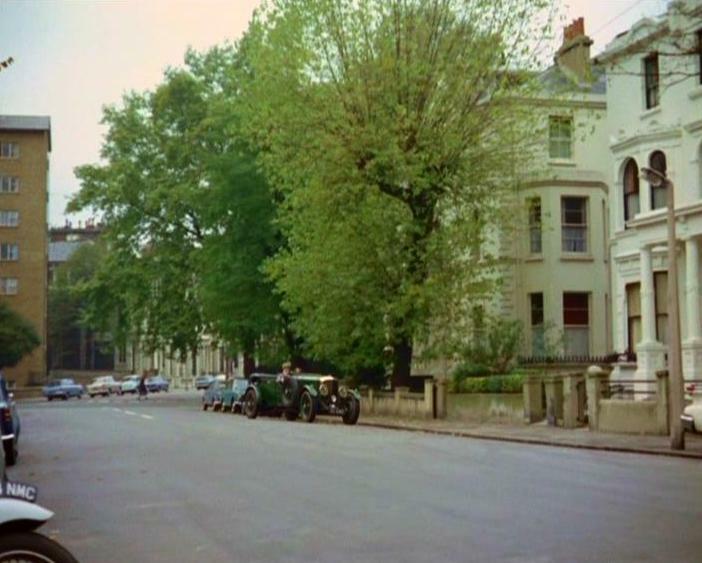 For example, recently I finished comparing the prints of the episode From Venus with Love, and concluded that if I had a Blu Ray I would have seen a stunt driver for Patrick Macnee. It should be clear - Rocky or Paul or someone else. Nevertheless, all I could see behind the doubles is Cyd Child again, and stand-in for Diana, maybe Annabelle Heath.